Sushi will always hold a special place in my heart. On our very first date, Drew took me out for my first taste of sushi. I was a little apprehensive, but fell in love immediately… with both sushi and the man that would turn out to be my future husband. My first attempt at sushi making was a huge success! The taste was so good, exactly what you’d find in a sushi restaurant (and so much more economical). The process is a bit time-consuming, but quite easy. And it turned out to be very pretty, if I do say so myself! I’ve contemplated making sushi for some time and was pretty excited when my brother and sis-in-law gave us a sushi kit for Christmas, taking the guess-work out of finding the correct ingredients! With a little research I’ve found that it’s much easier to find sushi staples than I had first imagined. Our closest grocery store, Albertson’s, even carries a good selection of sushi making ingredients in their International food section. Choosing sushi fillings shouldn’t overwhelm you either! 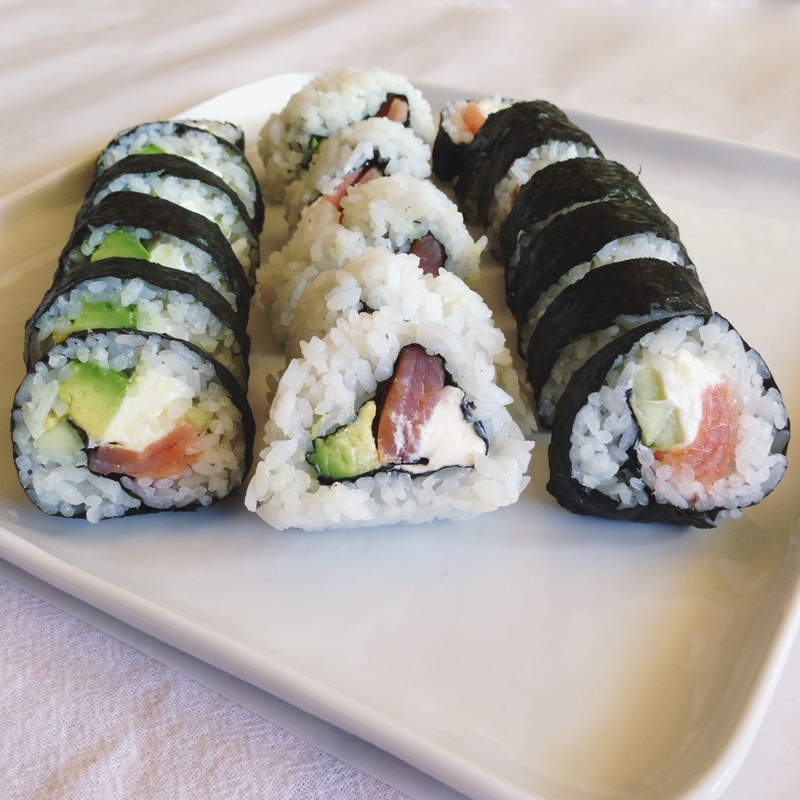 I would suggest that you pick ingredients that you are familiar with for your first sushi making experience… think cucumber, avocado, cream cheese, etc. Also, choosing ready-to-eat seafood (like crab or smoked salmon) is a safe place to start! These are my three variations of a smoked salmon roll. All are filled with smoked salmon and cream cheese. 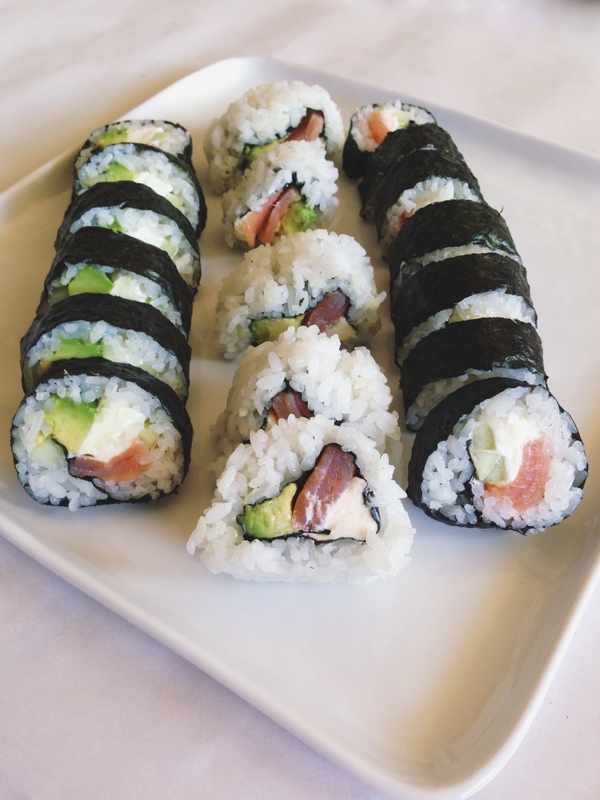 One roll contains avocado, one roll cucumber, and one has both. 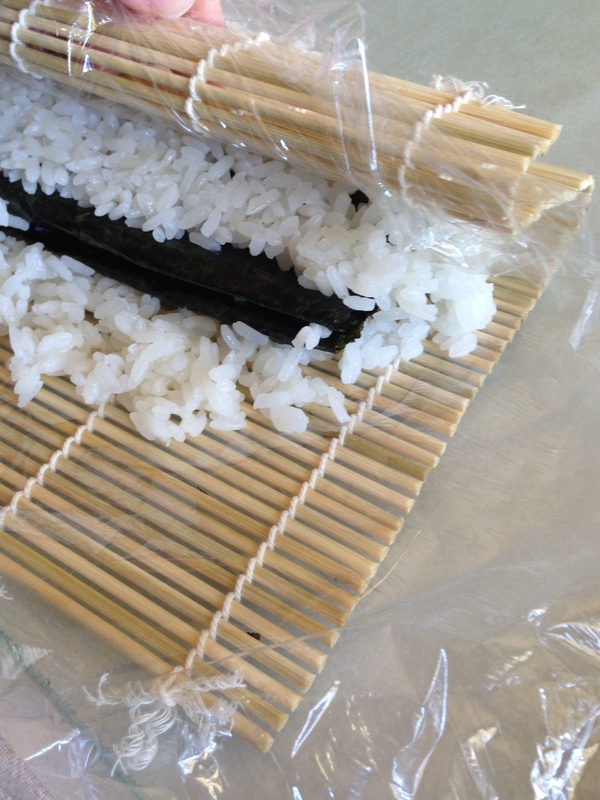 If you’re going to make sushi, you’ll want a sushi rolling mat and a rice paddle. Rice paddles are similar to wooden spoons, but with a much shorter handle and a wide, flat scoop. I found it to be very helpful while prepping the cooked rice and also with smoothing the rice out onto the nori sheets. Making sushi rice (the most important component in sushi) kind of intimidated me, but I found these great directions from Alton Brown. It’s the simplest recipe that I found, and the rice came out with a perfect sticky rice consistency. The stickiness of sushi rice is what helps hold sushi rolls together… you definitely wouldn’t want to try this with regular rice. Make rice according to the directions found HERE. You can see that my ingredients are half of what Alton Brown’s recipe calls for, but you should still follow his temp and time directions (I did use a smaller saucepan). This still makes enough rice for 3 sushi rolls. Slice avocado, cut the cucumber into thin strips. 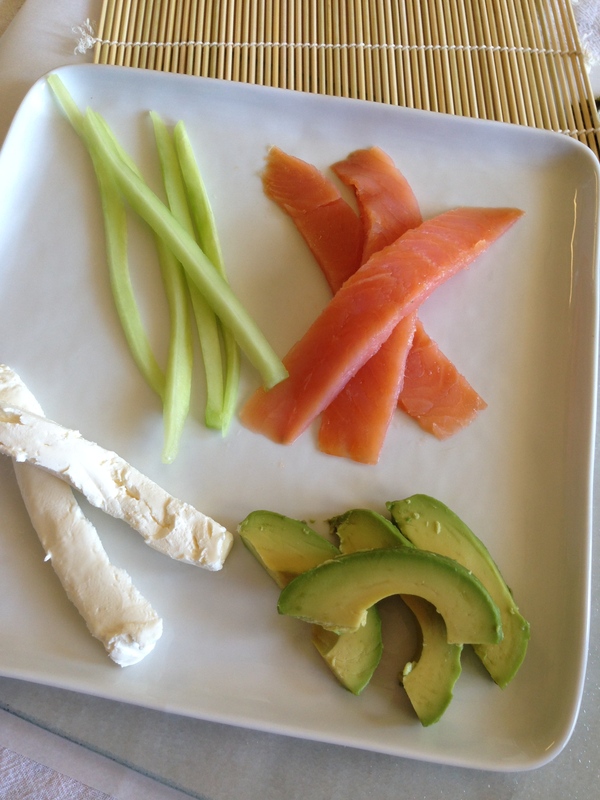 Slice the smoked salmon and cream cheese into long strips. 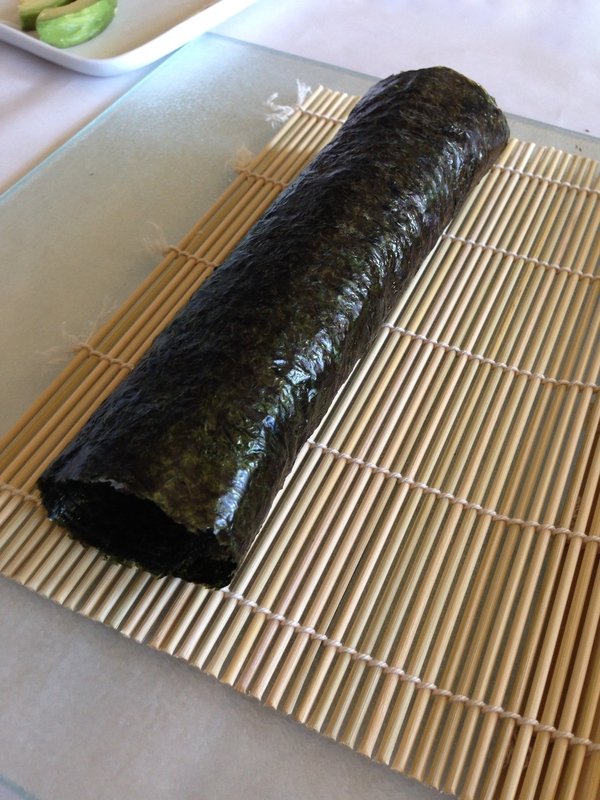 Lay one sheet of nori, shiny side down, onto your sushi mat. 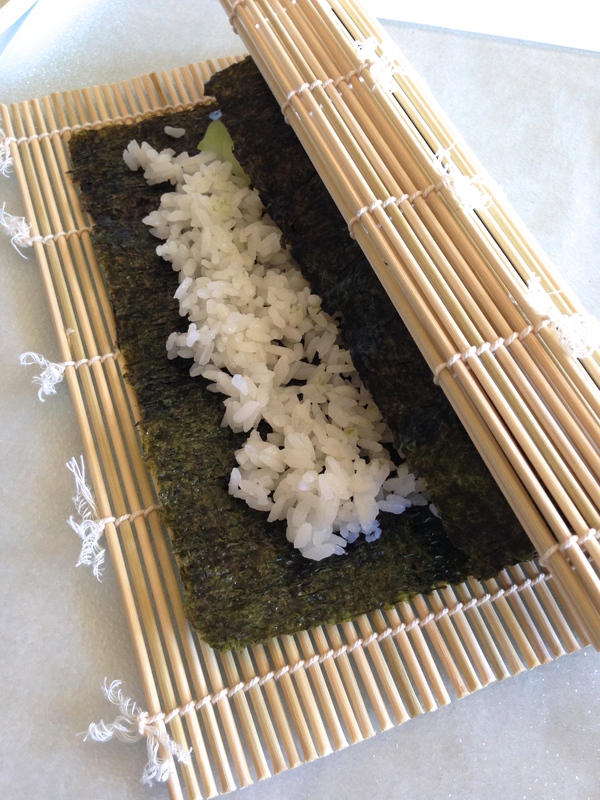 Use the rice paddle or your fingers (after dipping them in water so that the rice doesn’t stick to your skin) to spread the rice onto the nori sheet. Then add fillings. Carefully roll your sushi. Apply gentle pressure to the mat as you roll to help ingredients come together. Roll back the mat as you go. 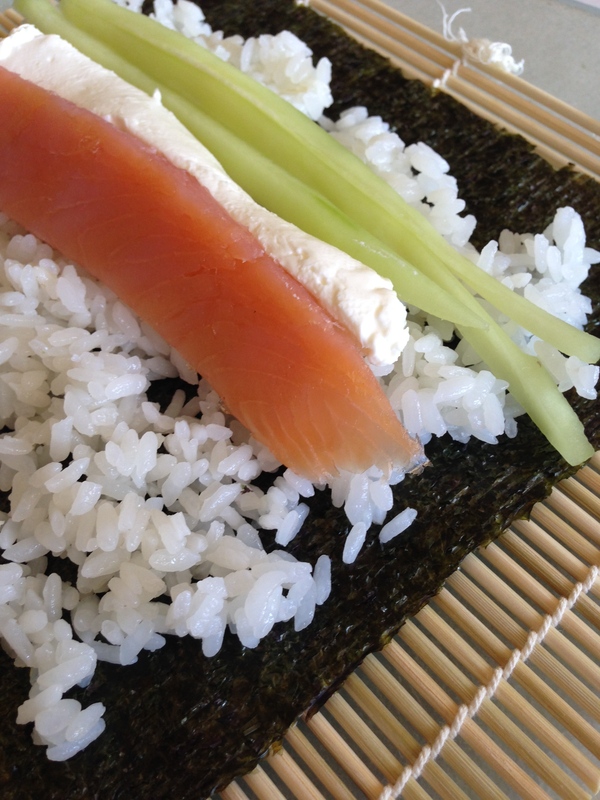 It’s okay if you don’t get rice to the edges of your sushi roll, the ends can be easily sliced off. I don’t have a seriously sharp knife, so I used a serrated knife to carefully slice the sushi roll, wiping the knife with a damp cloth in between each cut. 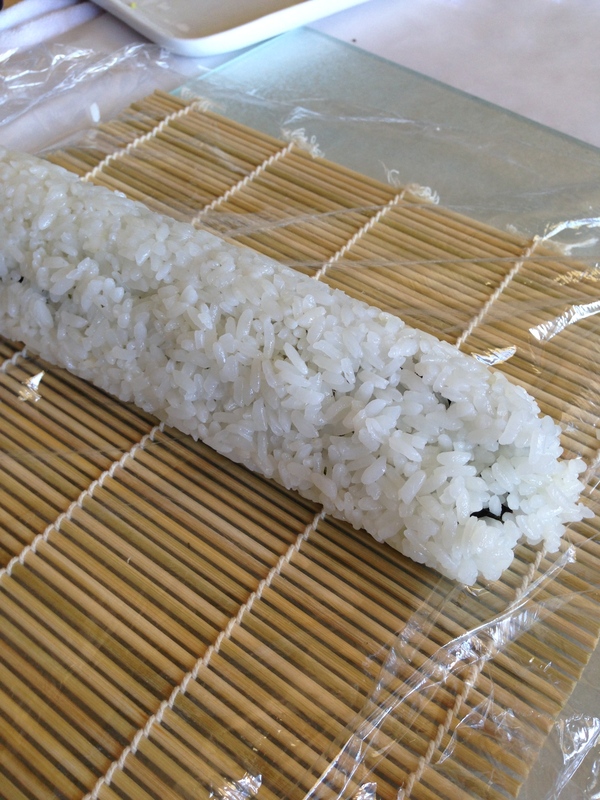 For making a reverse roll (rice on the outside), wrap the mat in plastic wrap. 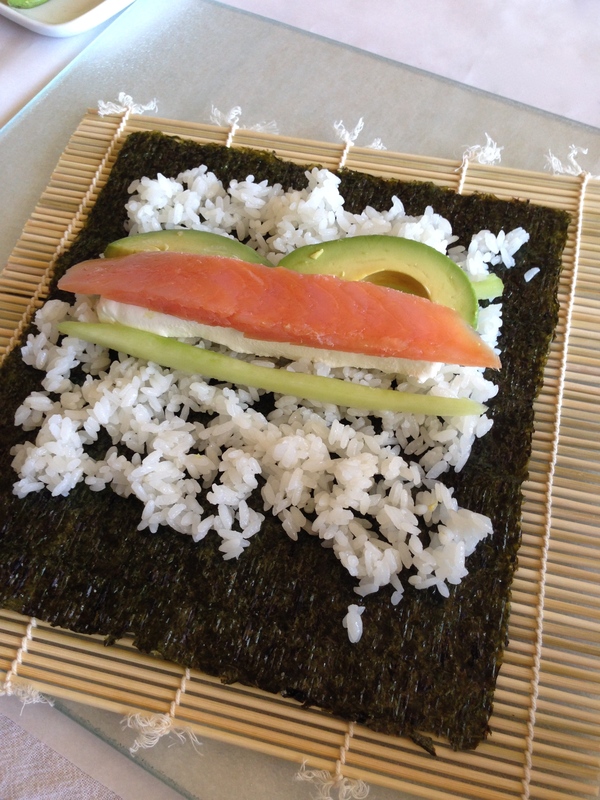 Spread rice out directly onto the mat, then place nori sheet and fillings on top of that. Dip your fingers and knife in water to make handling and cutting the reverse roll easier. Keep sushi cold in the refrigerator if you are not serving it right away. 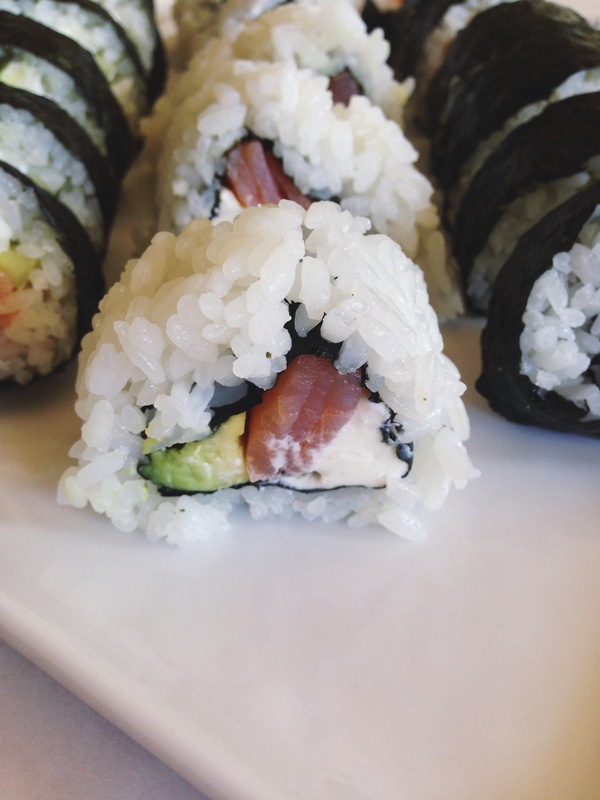 For food safety reasons, eat sushi the same day that you make it. I can’t wait to branch out and try different flavor combinations. What goes into your favorite sushi? I have to say that it was much easier than I had first imagined, and I was just thinking that this would be a fun date night activity to try! 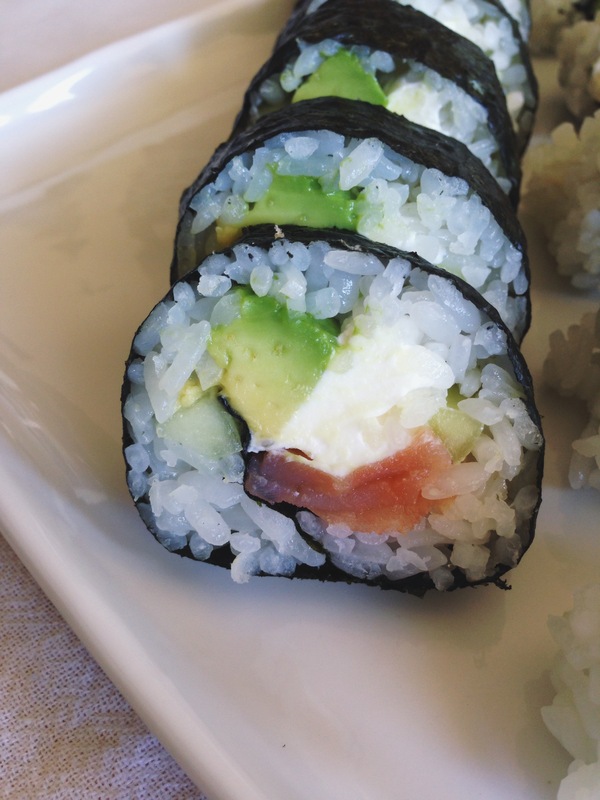 GREAT idea with the cream cheese… I make my own sushi too but never thought of adding cream cheese. Smoked salmon, cream cheese and capers are one of my favorites! Great pictures. Thanks Amber! I love cream cheese in everything, I’m pretty sure that I first fell in love with sushi because of the cream cheese in Philly rolls! Thanks Lisa! It’s totally worth trying! Thank you so much! I hope you give sushi-making a try! Thanks Nancy! I was quite happy that my sushi actually ended up looking like sushi. :) It was a fun challenge, you should give it a try!